Start the 2019 Multisport Season at the Barkin' Dog! 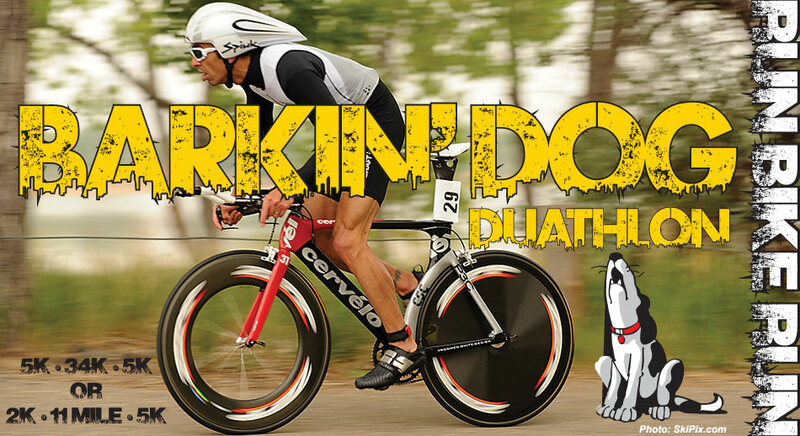 The Barkin' Dog Duathlon celebrates 22 years as the kickoff race for the summer multisport season! The Barkin' Dog is Colorado's largest duathlon, and consistently one of the largest duathlons in the Western United States. We hope to see you at the 22nd edition of the Barkin' Dog on April 20th! Location: Hobie Hill group area, near the Cherry Creek Marina. Free athlete parking will be available in the Cherry Creek High School SOUTH LOT, just a short walk or ride from the start/finish, transition, and expo area. Access to the SOUTH LOT is on Yosemite between Union and Belleview. There will be no race parking allowed in the main Cherry Creek High School lot due to other events going on at the school on race morning. Packet Pickup: Early packet pickup and race-day packet pickup options are available. Early Packet Pickup: Runners Roost Lakewood will be hosting early packet pickup on Thursday April 18th from noon until 6:30pm. You may pick up packets for friends and family with their permission. Packets picked up at Runners Roost Lakewood will not contain a timing chip. Athletes will have to pick up their timing chips in person on race morning. You will need to bring your bib number and a photo ID in order to pick up your timing chip. No one may pick up your timing chip for you. Race Day Packet Pickup: Quick and friendly Packet Pickup will be available on race morning. Packet pickup will take place in the expo area at Hobie Hill from 5:30am until 7:15am. Please remember your photo ID - you will need to show your photo ID when you pick up your race packet. No one may pick up your packet for you on race morning. Beginners: The Barkin' Dog Duathlon is very beginner-friendly, and we are constantly updating our resources for beginners. Our Duathlon FAQ's page will get you started! Once you've got your bearings, check out our Training Page for helpful tips and training advice from some of the area's best and most knowledgeable coaches! Awards: Cash Awards totaling $450 will be presented to the top-3 overall male and female Elite Wave finishers in the long course. A pro license IS NOT REQUIRED to start in the elite wave, or to win prize money, however you must start in the elite wave to be eligible for cash awards. Prize money will be in the amounts of $100 for 1st, $75 for second, and $50 for third. Age Group awards will be presented in the following age categories: 14 & under, 15-19, 20-24, 25-29, 30-34, 35-39, 40-44, 45-49, 50-54, 55-59, 60-64, 65-69, 70-74, 75-79, and 80-84, and 85+. Age group awards will go 3-deep in each age group in the long course, and to the 1st place finisher in each age group in the short course. Elite wave participants will not be eligible for age group awards. Special Category awards will be presented in the Clydesdale and Athena divisions, as well as male and female Fat Tire categories. Awards will go 3-deep in each long course division, and to the 1st place finisher in each short course category. Relay Awards will go to the first place team in Male, Female, and Coed categories in the long course duathlon. Relay teams are composed of one runner and one cyclist. There will be one award presented to the top short course relay. We will also present an award to the first place Tandem team in both the long and short course duathlon. Your entry into the Barkin' Dog Duathlon includes a spot on the start line of Colorado's multisport season opener, fast and accurate chip timing with split times for run-1, bike, run-2, and both transitions. Results will be live online with athlete tracking for your fans! Printable finisher certificates & personal finish line videos (weather permitting) will be available shortly after the event, along with FREE downloads of your race photos. You can also enjoy a tasty pancake breakfast and a quality gender specific tech shirt. Join us on the start line on April 20th! Every attempt will be made to hold this event regardless of weather conditions, however we reserve the right to alter or shorten the course in the case of extreme weather. Once accepted, entry fees will not be issued for any reason. You may cancel your entry and receive a 75 percent credit toward any other Racing Underground event until 30 days before race day or until the race sells out, whichever comes first. The credit will be valid for 12 months. You may transfer to another runner for a $10 fee until 10 days before the event. No transfers will be allowed fewer than 10 days before the event. No refunds or credits will be issued if the race is shortened, postponed, or cancelled due to weather. The Barkin' Dog Duathlon will offer the option of competing in the standard 5K/34K/5K format, or a shorter course format that is great for beginners and youth racers (1.2 mile run, 11 mile bike, 5K run). Both courses take place within beautiful Cherry Creek State Park, conveniently located on the south side of the Denver metro area. RUN COURSE: Click for a Run Course Map Run courses follow a mix of road, paved bike path, and well maintained dirt trails. Long course athletes will run an opening 5k followed by a 21 mile bike ride. A second 5K run will follow the bike. Short course athletes will start with a 1.2 mile out & back run on Run-1. Run-2 will be the same 5k course as the long course athletes. BIKE COURSE: Click for a Bike Course Map The bike course will take riders east through the park to the dam tower, then route them along the lake shore on their way back toward transition. Short course riders will complete one lap of the course, while long course riders will head out for a second lap of the course as they exit the Lake Loop road. Waves have been assigned and timed to minimize congestion on the bike course. Please be considerate of other racers. It is important that you keep to the right side of the road, except to pass. Motorcycle marshals will be on course to enforce this rule. Most questions are answered right here on the race website. If you can't find the answer here, please feel free to email or call us! Volunteering: If you would like to volunteer for a race, we would love to talk with you! Just send an email to info@racingunderground.com and we'll get right back with you. Other Great Events: Check out our website at www.RacingUnderground.com to learn about our other exciting running and multisport events! AGE GROUP: Solo Athletes will compete against other solo athletes in their specific age/gender group, unless they choose to enter one of the special categories listed below. Male and female age groups for the BarkinÕ Dog Duathlon are broken down as follows: Age 12-14, Age 15-19, 20-24, 25-29, 30-34, 35-39, 40-44, 45-49, 50-54, 55-59, 60-64, 65-69, 70-74, 75-79, 80-84, 85-89. ELITE: Athletes competing for the top overall spots may opt to race in the Elite category in place of their age group. A pro license IS NOT REQUIRED to race elite, and you must register as elite if you would like to be eligible to win a share of the $450 elite prize purse. Elite athletes will start in the first wave, and will not be eligible for age group awards. CLYDESDALE & ATHENA: Male Athletes Weighing 220 pounds or more may choose to compete in the Clydesdale division in place of their age group. Women weighing 165 pounds or more may choose to enter the Athena division in place of their age group. FAT TIRE (mountain bike) DIVISION: Many newcomers to multisport as well as a dozen or so of our regular participants, choose to compete on their mountain bikes. In fact, we often see nearly 10 percent of our participants on their mountain bikes at the Barkin' Dog. Athletes who race on a mountain bike or hybrid with a minimum tire width of 1.9 can choose to compete in the Fat Tire Division in place of their standard age group. Yes, you will still ride on the same paved route as the road bikers, but this division will even the playing field. RELAY TEAMS: Relay teams, composed of 1 runner and one cyclist may participate in one of three categories - Male, Female, or Coed. Single Sport Athletes -- Let's See What You've Got. Pair up with your favorite runner or cyclist and compete! TANDEM DIVISION: This fun division is in response to many tandem couples who inquire about the series every year. In the tandem division, one or both team members will complete the run courses, and both will team-up for the ride.